Things have been a bit busy the past few weeks. We had our baby (Jonah Benjamin Cormack) on February 10th, and he came out huge (ten pounds, eleven ounces). It wasn't anything too serious, but there was a small issue with his breathing and he had to be in the NICU for a few days. The NICU had mostly premature babies in it, which made our giant baby look like the Incredible Hulk in comparison. We are back home now, getting adjusted to life without sleep and to constant diaper changes (and the threat of being peed on during those diaper changes). After things settled down and we developed a routine, I had a chance to get out and get a few pictures. 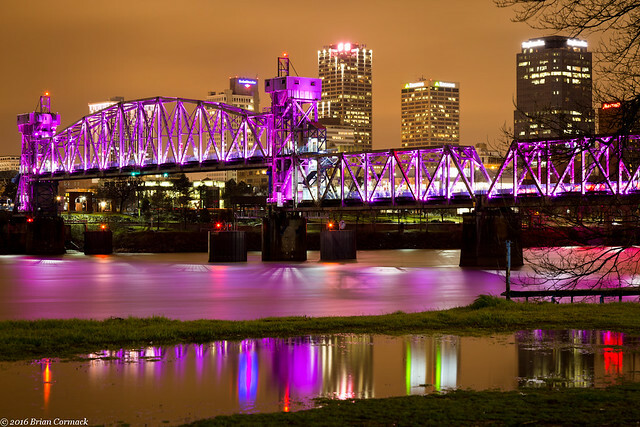 One rainy night last week, I headed out to downtown Little Rock. 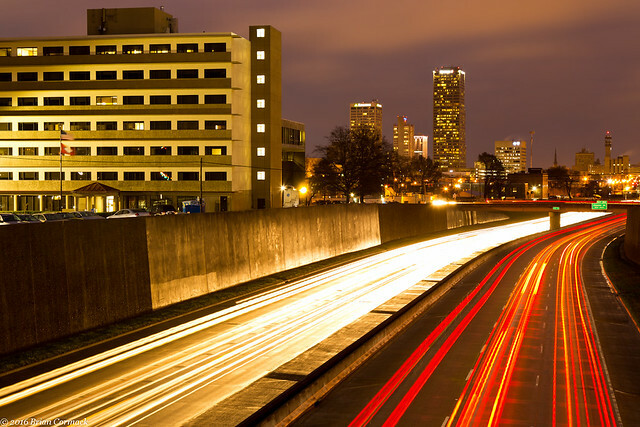 I went out to a bridge over I-630 which has this view of rush hour traffic and part of the skyline in the background. From there I headed into downtown and tried to get a few pictures. 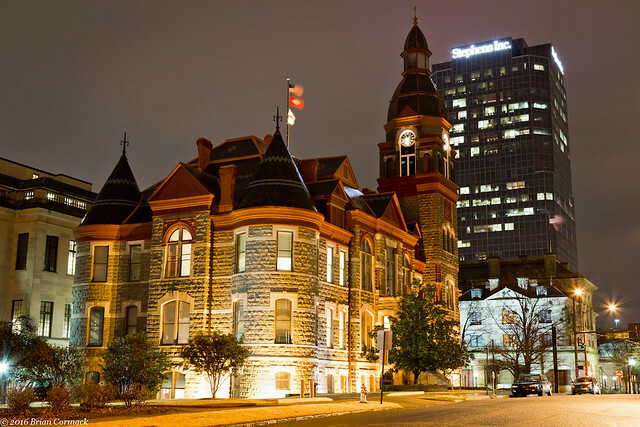 I headed by the Pulaski County Courthouse, which was built in 1887. It's one of my favorite buildings in Little Rock, and I've taken this shot many times. 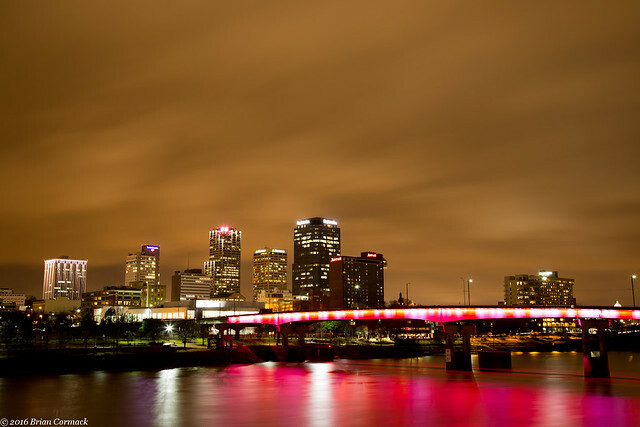 It had stopped raining, but the low clouds still lingered and reflected the city light. This was taken from the Junction Bridge. We had a lot of rain that day, and Riverfront Park was lined with deep puddles. I found this one, which had a little reflection of the skyline behind it. Luckily my work has an amazing paternal leave policy, so I'm going to be able to spend a lot of time with the new baby over the next several weeks (and maybe sneak in a few more trips out to take pictures when I'm not changing diapers). On my way back home, I drove through the tiny town of Houston in Perry County. Houston was incorporated in 1908, and its population grew thanks to it being a stop on the Choctaw, Oklahoma, and Gulf Railroad. The town currently has a population of about 160, and the rail line still runs through the middle of town (although it doesn't stop here). 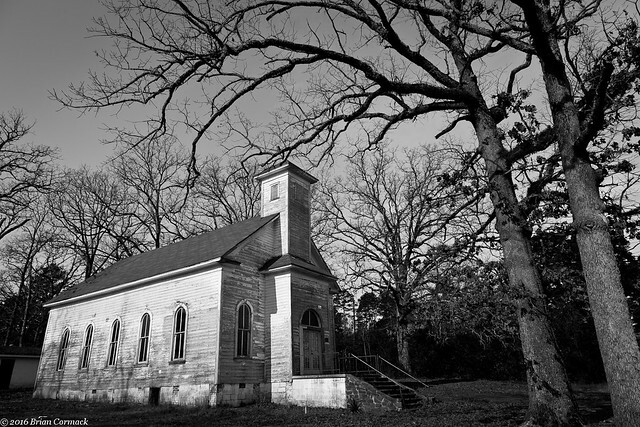 Near the tracks is the old Houston Methodist Church, which might be one of the prettiest abandoned churches in the state. The church was constructed in 1912, and closed in the 1990s. Unless he decides to get here early, the baby will be born in a few days. So I headed out Saturday morning for one last photo trip before the kid gets here. My plan was to drive to the Holla Bend National Wildlife Refuge, which is usually home to thousands of traveling birds in the winter. I drove out early enough to get there at sunrise, but the trip ended up being a bust. There weren't any birds there, they must have found another place to sleep (or they've already moved on for the year?). But along the way, I stopped at the Port of Russellville. 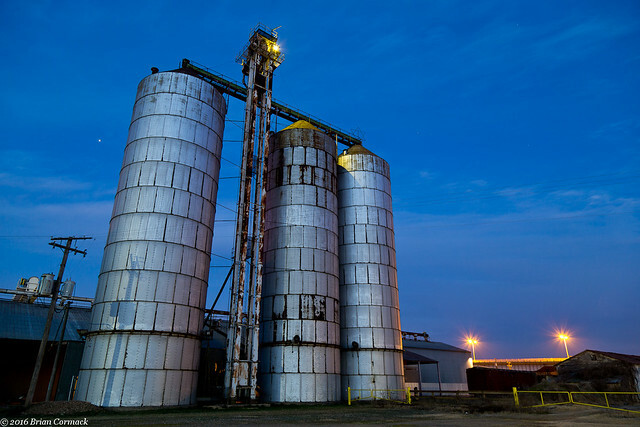 The port sits along the Arkansas River, and I got this shot of these silos against the morning sky. So our baby is scheduled to arrive in a week, and I assume that I probably won't have much free time after that. So I really wanted to get out last weekend and make an attempt at a star trail photo. I did some searching for good places, and ultimately decided to try to get some pictures at Lake Sylvia, in the Ouachita National Forest. 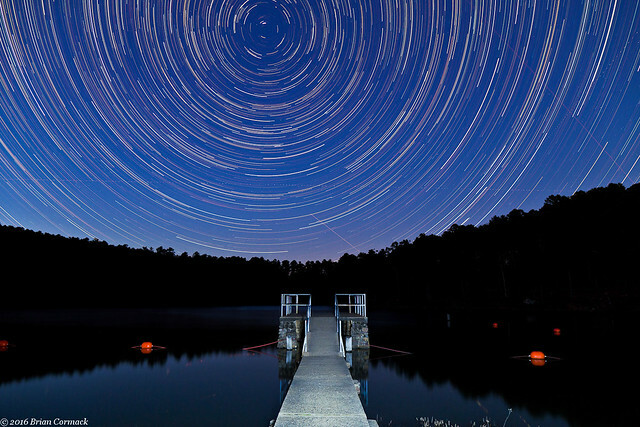 The lake is just about 45 minutes west of Little Rock, but is far enough away from the city that there should be a decent amount of stars in the sky. The only problem is the lake access is closed in the winter, but I called the National Forest Service and they were ok if I went in there for a few hours to take pictures. So last Friday night I headed out to the lake after work and got there just before sunset. I put the tripod by the concrete swimming platform, which just about points due north. After it got dark, I set the camera to take :30 second exposures, which captured some movement in the stars. After about two hours, I had taken 223 pictures which I later combined to get this view of star trails above the lake.